Speck is a protected, specialty bacon produced solely in the Alto Adige (or South Tyrol) region of northern Italy, which borders Austria and Switzerland. Based on ancient traditions that can be traced back to 1200 AD, Speck is the result of an inimitable mix of Mediterranean and northern European influences that converge in the geographically unique Alpine climate of the Alto Adige. 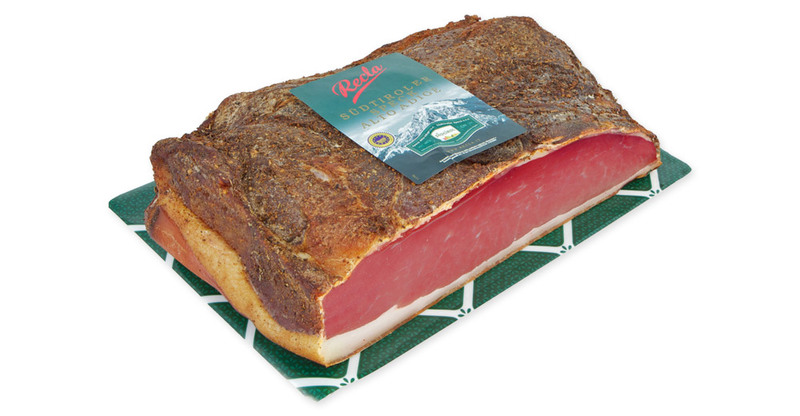 The Recla family has been making traditional pork products since 1620 and was the first Italian company granted permission by the U.S. government to export Speck Alto Adige to America. Recla follows the unofficial Speck production rule of “A little salt, a little smoke and lots of fresh air,” but officially is very serious about creating the highest quality Speck possible. Starting with very carefully selected lean, firm, traditionally trimmed thighs from pigs raised on farms renowned for their quality controls, Recla then seasons the meat with a secret family blend of salts and other spices. The 22 to 24 week dry curing maturation process requires an abundance of patience and artisanal expertise. Lightly smoking the pork with beech wood, and exposing it to the complexities of the region’s particular clean, fresh mountain air aids in the development of the distinctively mild, delicate flavor and incredible tenderness that defines authentic Speck Alto Adige. It is often said that, “Everything tastes better with bacon.” Surely then, everything tastes specktacular with Speck. Application: With no additional cooking required when preparing Speck, it can simply be brought to room temperature, sliced and enjoyed, with or without the spiced crust trimmed away. Speck can also be incorporated into polenta, pasta, rice and any other grain-based dishes, as well as used to add savory flavor to sauces, soups, salads, quiches and other egg dishes. Speck is delicious wrapped around soft goat’s milk cheese or honeydew melon. High in protein, low in cholesterol, in accordance with strict fat to lean specifications, Speck Alto Adige IGP makes a healthier alternative to many other meats and is a great nutritional substitute for fish, chicken and eggs as well as other meats. Pairing: Speck is traditionally served in South Tyrol with rye bread or crackers but has a very versatile flavor that goes well with a variety of cheeses and tastes great with beer. Mostarda sauces were first made by rural families in the 17th century and used purely as a special condiment for Christmas time. The original creation was a combination of mustard, vinegar, candied fruit and wine must, the last being the ingredient for which Mostarda is actually named. mustard oil and, combined in different ways, Lazzaris creates an incredible sweet and spicy array of specialty mostardas to be enjoyed throughout the entire year. 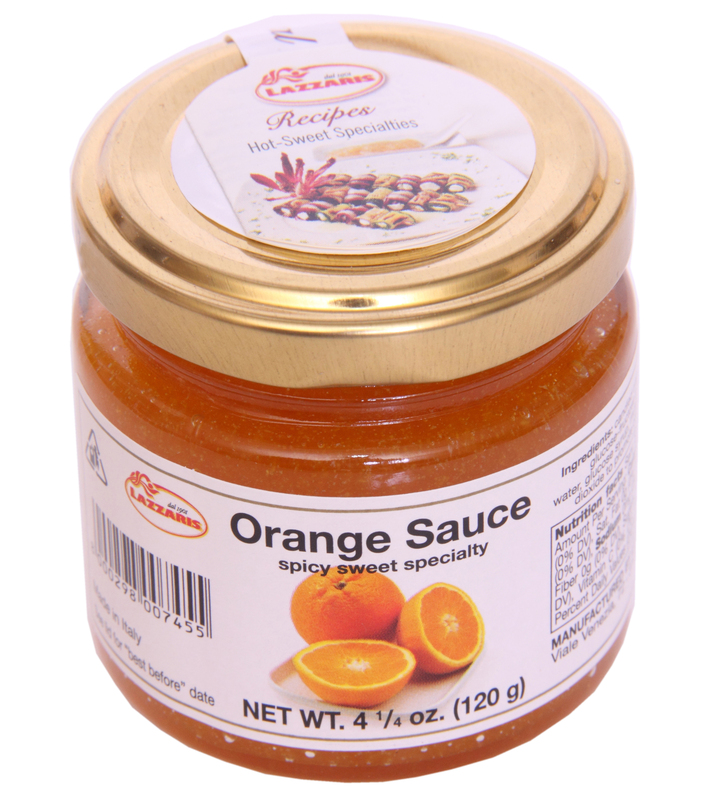 Lazzaris Orange Mustard Sauce is a delicious and fragrant blend of top quality puréed oranges and mustard oil. This tantalizing mix of sweet, sour and spicy flavors is delicious with roast duck, chicken, game or with fresh, creamy cheeses but would also add unique flavor to a variety of modern and traditional dishes.